"What did we do to you?" Members of the Cayucos Fire Department found themselves asking the residents they protect that question on July 7. The Cayucos Fire Protection District had convened for its first meeting since local voters rejected a hefty tax increase that would have boosted support for the cash-strapped fire department. STAYIN’ ALIVE: The Cayucos Fire Protection District voted unanimously on July 7 to approve a 2016-17 budget for the Cayucos Fire Department. The department has struggled in recent years with recruiting paid-on-call firefighters. A small meeting room at the fire station on Cayucos Drive overflowed with people and emotions, as fire service officials and members of the public discussed the implications of a flopped ballot measure that caused community strife and left the future of the department uncertain. The Cayucos Fire Department, which has existed since 1948, has operated with diminished staffing for three years and considered dissolving last October, which would have transfered fire protection duties to the SLO County station across town. The department is currently made up of paid-on-call firefighters and is able to staff two people on site at all times, according to Mark Walton, a Cayucos fire captain and vice president of the Cayucos Firefighters Association. "For the last five to 10 years our roster has been declining even though we make attempts to recruit every year," Walton said. "[Being an on-call firefighter] is hard work, it doesn't pay a lot, and it requires a lot of training." The staffing crisis is one facing many fire departments in California, according to fire officials in the county, but Walton said the Cayucos Fire Department is especially vulnerable given the area's high cost of living, aging demographic, and small tax base of about 2,500 residents. So the fire department devised a solution: Measure C-16. If the measure had passed with a two-thirds majority vote, it would have brought in enough revenue to hire permanent, full-time firefighters and provide benefits. But, in turn, the local fire tax would have spiked to $125 per housing unit (or $500 per single-family residence), a five-fold increase from the community's current fire tax. "It was a huge tax increase—not going to deny that—but it set us up for the next 10 to 15 years," Walton said. The tax solution did not garner enough support in Cayucos, with 60 percent of the town voting "no" on the measure. Voters were taken aback by the high price tag, and some were even offended by it. Tensions over the tax proposal divided the community in the weeks and months prior to the vote and spilled out into the July 7 meeting as the community dealt with the aftermath. "We've been here for all these years, and all of a sudden everybody wants to get rid of us," Cayucos Fire Chief Mike Minetti said at one point during the meeting. "What did we do to you?" "I don't think we were informed enough about the tax measure," responded one local. Some residents defended the department, pointing to its track record of quality service. "I would not be here if not for them," said one Cayucos man. "That's an emotional thing for me and an emotional thing for this community." Ultimately, the Cayucos Fire Protection District board voted 3-0 on July 7 to keep the department running for the 2016-2017 fiscal year, adopting a budget of $550,000. "We're going to continue doing it until we can't do it no more," Minetti told the crowd. Walton said after the meeting that the department is currently pursuing three grants to help bring in more money to the station. He added that the department's performance will be closely monitored as the year progresses. "I would hope that we're professional enough to put the community's best interest first," he said, referring to the option of dissolving the department if it were the best choice. In the discussion about dissolution, some residents worried about what would happen to their taxes if fire protection was handed over to SLO County, and others questioned how effective the county's coverage of the community would be in the absence of a local fire department. 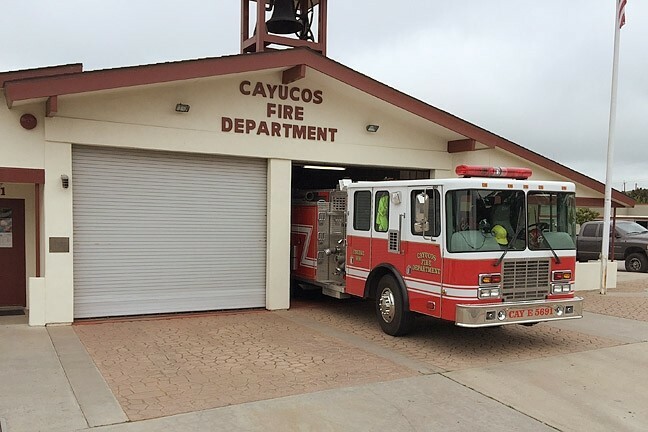 Bruce Gibson, SLO County's 2nd District supervisor, told New Times he was confident the county would be able to provide Cayucos with adequate fire protection through its station if the local department dissolved. Gibson said that he didn't think the tax structure would need to change, but added that any tax increase would have to be approved by a public vote anyway. "I can't give an iron-clad guarantee," Gibson said. "It would surprise me considerably if the county refused [to provide fire protection to Cayucos]." Gibson expressed some concern about how the Cayucos Fire Department will manage to effectively carry on with its current budget and staffing. "If they choose to continue, I would expect they provide their community a detailed description of how their services will provide quality fire protection," Gibson said.